Football season is here. My husband is in heaven for the next few months. Like all sports, I prefer watching football in person than on the television. But some good snacks always make me more inclined to watch a game. Chips and dip are a classic game day snack, but both can be overloaded with fat and salt. Here are some homemade versions that won’t break your calorie bank. You can feel good about the veggies in the salsa and guacamole. And yes, avocados are high in fat. But the monounsaturated fats in avocados can actually be beneficial to your health – when eaten in moderation and replacing saturated fats. So eat that guacamole, especially if you are replacing a cheese sauce. 2. Spray both sides of tortillas lightly with cooking spray. Stack tortillas and cut into sixths (flour tortillas) or fourths (corn tortillas). Arrange in a single layer on baking sheet. Lightly sprinkle with salt. 3. Bake for 5-7 minutes, watching to make sure they don’t burn. Once they look lightly “toasted”, flip over and bake for 2 minutes more. Serve with chips and salsa. 1. Combine all ingredients in a bowl. Allow to sit in refrigerator for a couple hours for best flavor. 1. Mash avocados with 1 tablespoon of lime juice. (A pastry blender works well here.) Stir in remaining tablespoon of lime juice, pico de gallo, and salt. Serve immediately or cover and store in the refrigerator. Recipe Notes: Using flour tortillas provides a little different taste than normal tortilla chips – a cross between tortilla chips and pita chips. Adjust the amount of onion and jalapeño in the pico de gallo to your preference. Raw red onion can become very powerful as it sits, so keep that in mind. You could use raw garlic, but I actually prefer powder here, as it can mix into more of the salsa than chunks of minced garlic. Low iodine adjustment: Use non-iodized salt. 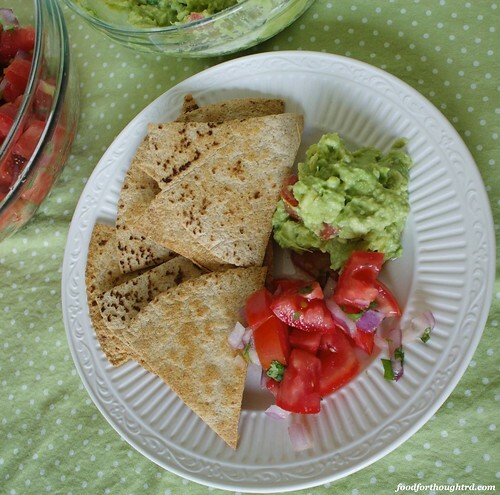 You can make homemade tortillas or use salt-free tortillas.